Room number 5 is really nice, the terrace and kitchen. The Guesthouse is so clean and location is close to everywhere. I really loved the fact that the place is as advertised and as per reviews online. It was a high for me because as a business traveler most of the times I have ended up after payment at facilities whose status are a far cry from the advertised ratings and reviews. Thumbs up to Russland Guesthouse . I was happy everything was as advertised except if you don't like walking, it is a little bit far from the Station. Will return there again notwithstanding . Very nice and clean place, quite near to two underground station, we really enjoy it. Great value for money! Incredibly nice and helpful personel! Yulia and Andrey are the best! This was the 4'th time I've staid at this place. 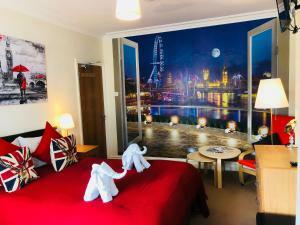 I use to travel to London for work and I choose Russland whenever I find a free room. All tough some rooms have shared facilities, I found them always in top clean condition. They do not have a 24 hours reception but check in/checkout was no problem, communication with the staff was precise and smooth. 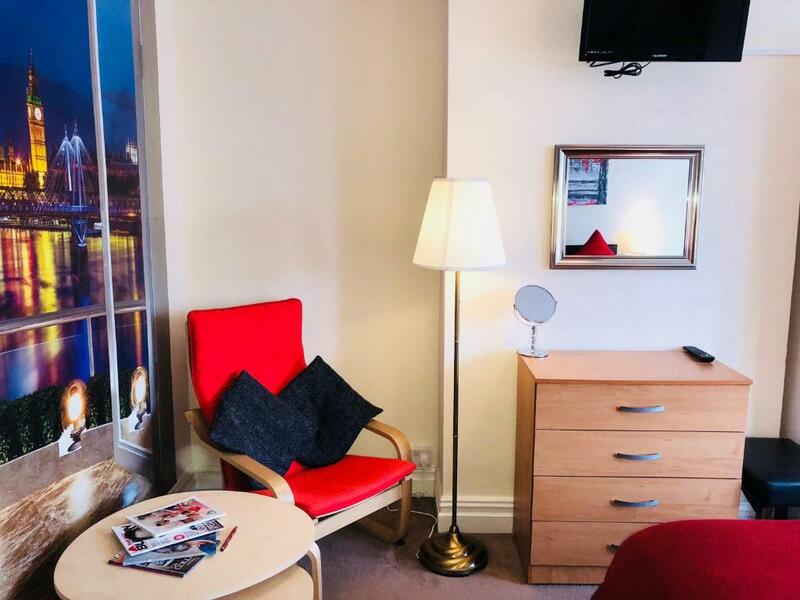 I would recommend this place to anyone who want fast access to downtown London (walk 8 minutes to train station then 15 minutes train ride to London Euston ).Best value for money ! 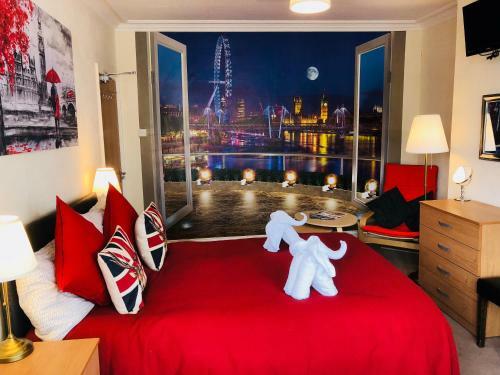 It was very well organised and clean and well connected to the city, and super close from the Harry Potter Studios! It was a great value for the price we payed, we'll sure have it in account when we come back to London. And the personal were really nice. The Tesco down the road had an excellent bathroom that I had to use often during my trip as I would rather walk 10 minutes than use the bathroom provided. A great location to stay in London. It’s quite far from the city center, but the tube station is very close, and it takes 14-40 minutes to get to the center of London (depending on the type of transportation used). While staying you get a unique feeling of being a part of a quiet authentic neighborhood. The room was great, the staff was welcoming. We could use all the facilities without any problems. Next time, when I need a place to stay in London I’ll choose this guesthouse again. Extremely clean, tidy and well-organised. Staff are highly professional and extremely knowledgable, friendly and communicative. The room size was enough for our stay, although not overly spacious. The local area is entirely residential and we felt safe walking through it. 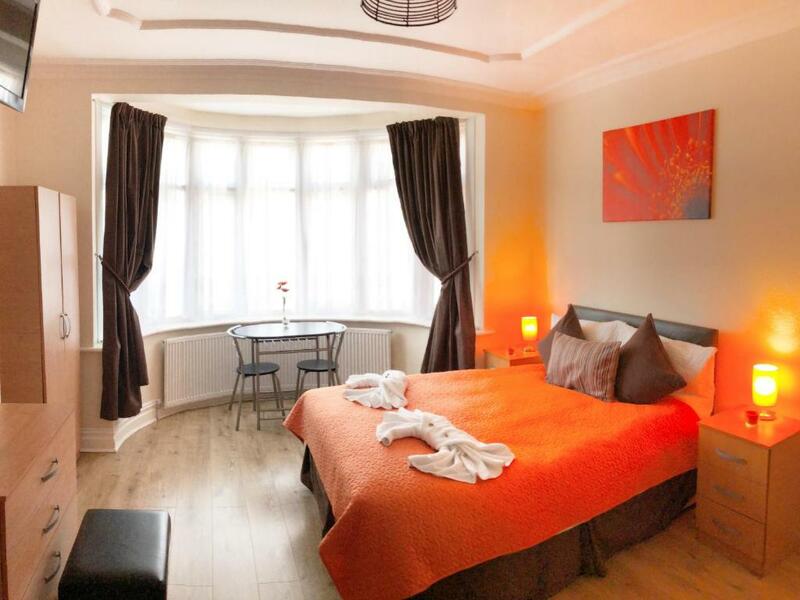 Lock in a great price for Russland Rooms – rated 8.4 by recent guests! One of our best sellers in London! Located in the Brant district of London, Russland Rooms provides a garden. The property is around 3.1 mi from Wembley Arena, 3.1 mi from London Designer Outlet and 3.7 mi from Wembley Stadium. Portobello Road Market is 7.5 mi away. 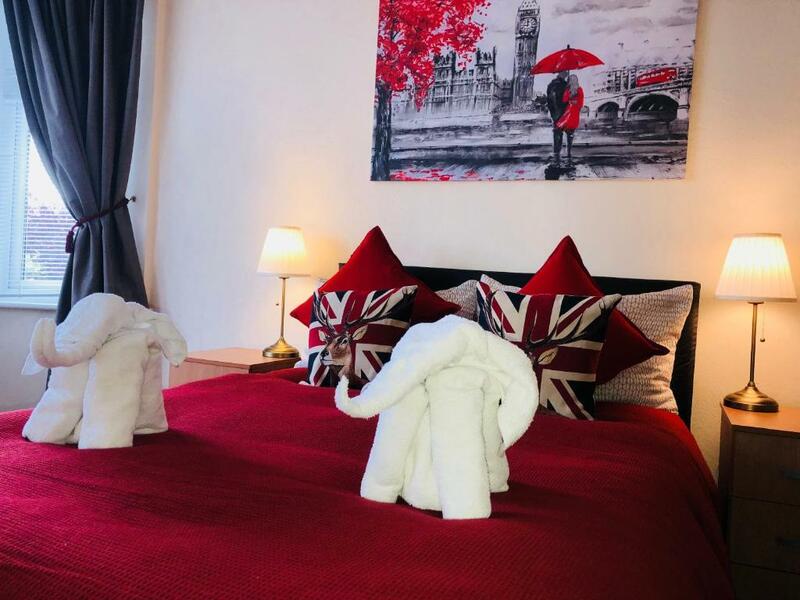 All rooms are fitted with double bed, wardrobe, a flat-screen TV, a shared bathroom and a kitchen. Hampstead Theater is 7.5 mi from the accommodations, while Lord's Cricket Ground is 8.1 mi away. London Heathrow Airport is 9.3 mi from the property. When would you like to stay at Russland Rooms? This double room has a shared bathroom, dining table and TV. The kitchen is shared, but guests are welcomed to use all facilities in there. House Rules Russland Rooms takes special requests – add in the next step! Even though It's well connected It's pretty far away so just take your time. Everything else was perfect. I now understand why they have a no refund policy because everyone would ask for one. Upon arrival we were told that it was a shared bathroom which was no stated when booking and to make things worse 2 of the light bulbs had broken so I had to use the torch on my phone to go the bathroom. There is no parking provided which would have been okay, however there was no secure parking available near by and the owner expected us to park on the road several streets away. Also during check in the owner wanted to take a picture of my passport on his iPhone which just seems unprofessional and a bit shady. On the second day of our stay there were 4 large spiders which I am terrified of in our bathroom I told the owner and the response I got was ‘there is a broom in the garden, move them yourself’. Later that day I messaged the owner again to say that there was no toilet paper in our bathroom and asked where I could find some to which I got no reply. I then messaged him again the next day with the same question to which he replied ‘you booked a self catering room, we don’t provide toilet paper’. I’m not sure what type of establishment they think they are running but self catering only means that they do no provide food. Overall, it was a terrible stay I would never stay again, I would rather have to commute 8 hours a day than stay there. It was quite hot in the room at nights. The shared bathroom was a very slight inconvenience due to messy and disorganised guests sharing with us. The kitchen facilities were good, but not great. We would have preferred to have a blender for making veg/fruit juices and there were a couple of times we noticed certain facilities to be 'missing' (can't remember exact details off the top of my head). The local area is fairly far from most everyday necessities and there are only a few public transport services servicing it. It is quite far from the city center and room number 1 is too small, the bed is between 3 walls, feeling a bit claustrophobic. Garden needed a few colourful plants. Looked bare. Room was clean, with fresh air, lots of light in the room and good sized. One single staff was helpful in giving me details of property and direction to local facilities. . Linen and towels clean. Loved my stay. Property was really and I loved it. Only a very small problem was some other quests who didn't think about other quests. They came home at night time and talked very loud in a kitchen which was close to our room. Some other quests knew how to behave and this was not a problem with everyone. The house was lovely, everything so clean and well organised. And the room was so beautiful. The host was very gentle and even location was perfect. We spent 4 nights and I could come back anytime! I even found really nice shops from the centre of Harrow, better and cheaper than in centre of London. So good reason to visit! The bathroom could have used a little more attention. 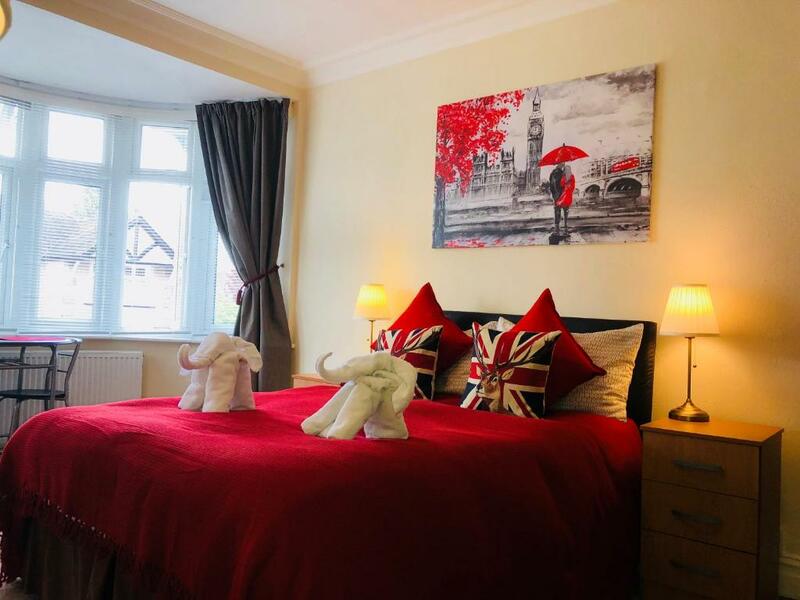 We chose this property for a 5 day vacation in London and it was just the way we had hoped it will be. Don't be scared by the number of tube stations from the Harrow and Wealdstone station to the center, because the subway is pretty efficient. We shared the bathroom with 3 other couples, but there weren't any problems. Our room was perfect. We had a lot of space to put our things. 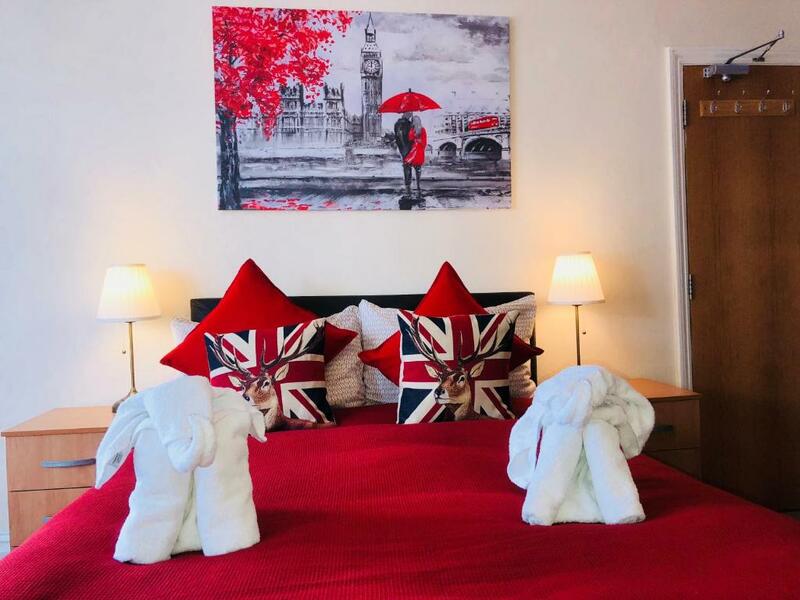 If you want to make a trip to London, we recommend that you book this place. We also have to mention the neighborhood which is pretty quiet. You also have a Tesco at about 7 min of walking distance from the house, from which you can buy anything you need. The house was cozy and very clean. Room were modern and high standard. Easy access to bathroom that was always available. Quiet area. Short distance to tube, bus and train. Tesco is nearby. Easy access to washing machine in the kitchen. Housekeeper was lovely and very helpful. I recommend this location. No flexibility in case of any change in the original booking. I left one day earlier and i couldn't get anything back for the day the room was vacant even if let a member of the staff know 3 days in advance at the moment of the check-in. The neighborhood could be better, it doesn't give you a feeling of security Internet keeps dropping every 20 minutes The lighting in the room could really be improved The heating in the room did not work. Not really a comfortable experience so thanks god I was travelling alone and not with my family. Even if we had to pay an extra tax for the cleaning service (50 pounds/room) the rooms were superficially cleaned. Also the bathroom door had a very strong squeaky sound, annoying especially in the morning.